Velvet Paw Creations: "Memory Fragments of A Lovely Day" Artistic Outpost projects Part 2! "Memory Fragments of A Lovely Day" Artistic Outpost projects Part 2! 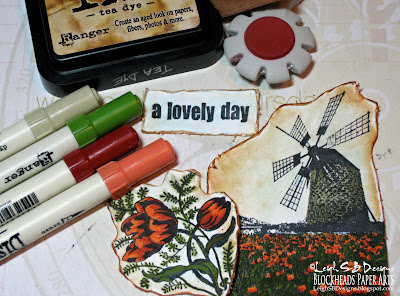 I'm having fun with Artistic Outpost stamps this week and yesterday I shared my "Touch of British" vintage grunge card and I'm back today with my 2nd project titled "Memory Fragments of A Lovely Day". 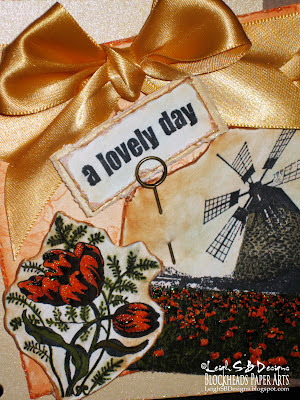 I used the Windmill, Tulips and the sentiment images from the same stamp set called A Lovely Day. Artistic Outpost rubber stamps are now available in the Blockheads Paper Arts store so go check them out! Stamp all the images onto Neenah Solar White cardstock with Tuxedo Black Memento ink. Colour the images with Distress Markers. I used Peeled Paint for all the greenery, Dried Marigold and Fired Brick on all the Tulips and Old Paper on the Windmill. Lightly colour the sky and the background of the Tulip and sentiment with a Turquoise Green watercolour pencil and blend with a Dove Blender Pen. Cut everything out loosely following the outline of the images and then distress all the edges with Tim's Distress tool so that they look like torn fragments. 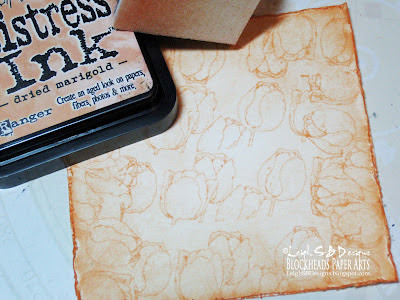 Distress the edges with Tim's Distress tool and apply Dried Marigold Distress Ink lightly to the whole piece of paper and heavier along the roughened edges. Stamp one of Blockheads' Tulip images from the Flowers full sheet set all over the mat also with Dried Marigold Distress Ink. 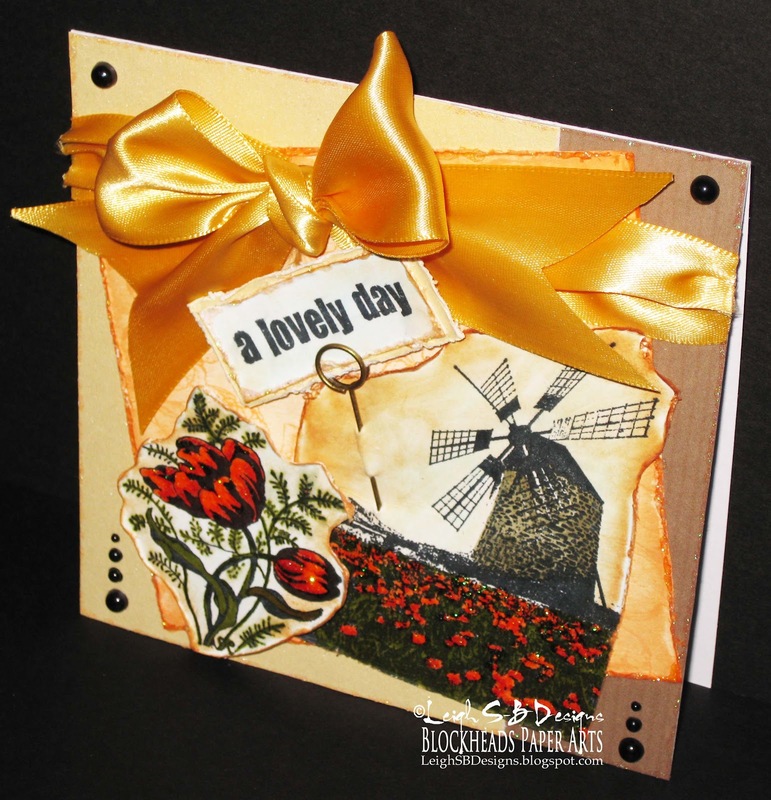 Make a square top folded card from white cardstock and cut a panel from pale yellow pearlized cardstock and a panel from corrugated brown cardstock and adhere the panels to the folded card then the Tulips panel at an angle with craft glue. Adhere the sentiment to a scrap of the pearlized yellow cardstock and distress the edges. Attach it to one of Tim's brass/gold coloured Idea-ology Memo Pins and poke it through the Windmill fragment. 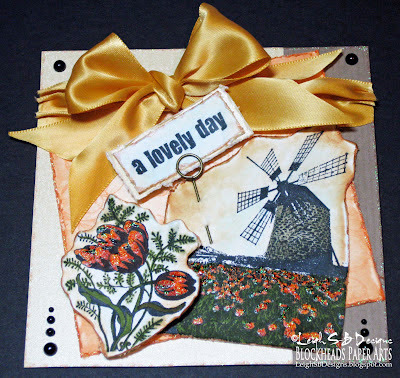 Adhere the Windmill fragment to the card with glue dots. Then adhere the Tulips panel with pop dots for extra dimension. Make a bow from wide orange/gold silk ribbon and trim the ends into dovetails. Adhere 2 scrap pieces of the ribbon to the card and gather the ends and adhere the bow with a glue dot. Now for some fun challenges! Another lovely creation, Leigh! It's wonderful to have you play with us again at Tuesday Alchemy! Another beautiful creation! 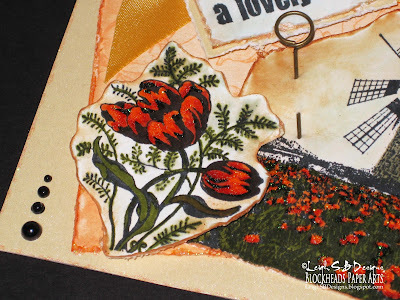 I love the colours you have used for the stamped flower it makes it really stand out. Charming, Leigh! I'm going to play with my Artistic Outpost images tonight! Love your card - I am a huge fan of windmill's being a dutch girl at heart. Thanks for sharing with us at Tuesday Alchemy. Absolutely GORGEOUS!! :) LOOVE those colors..looks wonderful. Thank you so much for taking the time to link up your talent and creative ideas with us at Make It Monday! How pretty! I especially love how you created your own pattern paper! Thanks for sharing yet another great creation with us at Tuesday Alchemy! This is beautiful! Really like that stamp set - it's so versatile. Great card! Lovely card and colours you used! Thanks for joining in at Creative Craft Challenges this week. 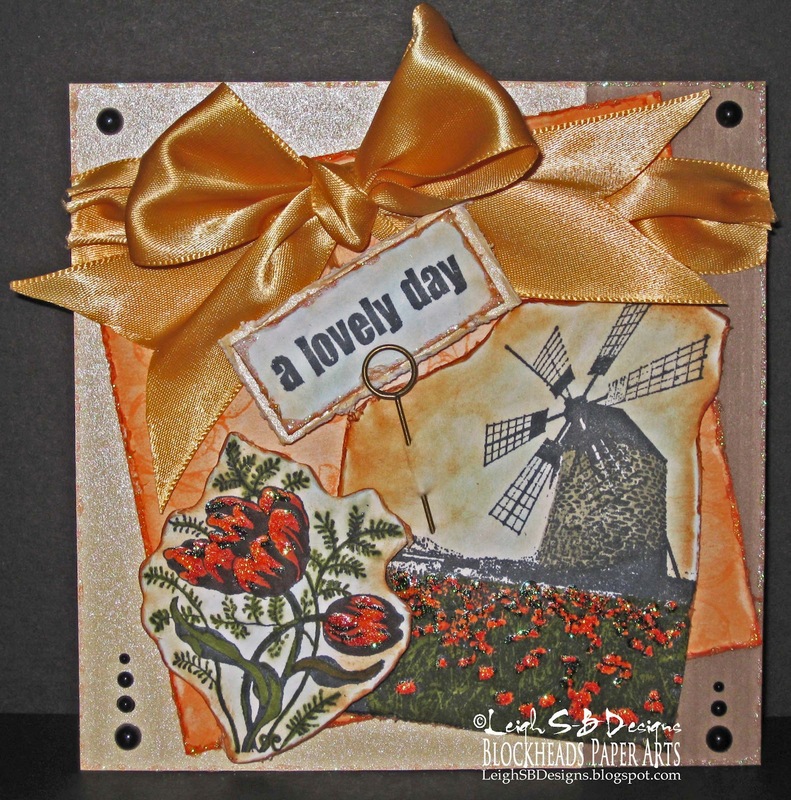 A beautiful card, a fabulous design, your colours are stunning and I love that stunning bow! !